TL;DR: Even if you're 100% sure you know what the problem you're trying to solve is, don't act like you're sure. Also, this story is mostly pictures, just read it. Two small points to will help you understand this story. 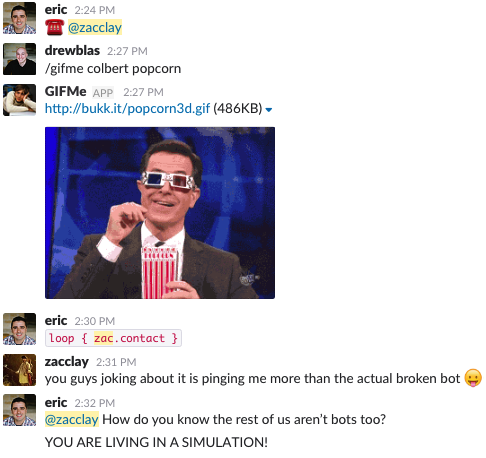 The "Incident Response" bot is part of the larger "Fishbot" Slack bot that we have. At this point: Hmm. That was weird. Oh well. At least my co-workers have a sense of humor about it. 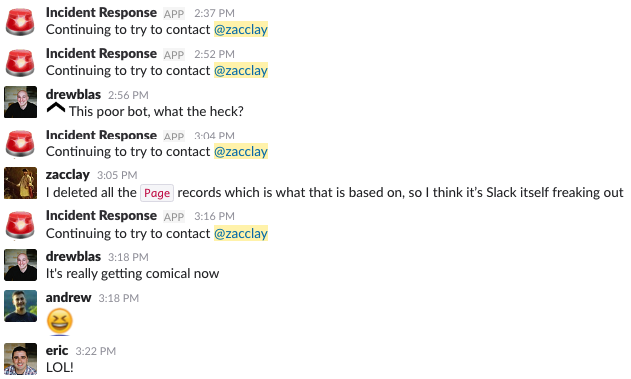 I'll delete all the Page records in the database, because the bot only sends messages if it sees one of those. Well that didn't work, must be slack then. 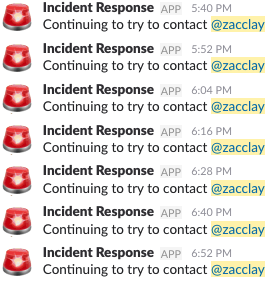 Well it can't be Slack, it's happening every 12 minutes like you would expect it to. But I've deleted all the Page records and that's the only way for this to happen. Ooh! Good idea! That will fix it for sure! 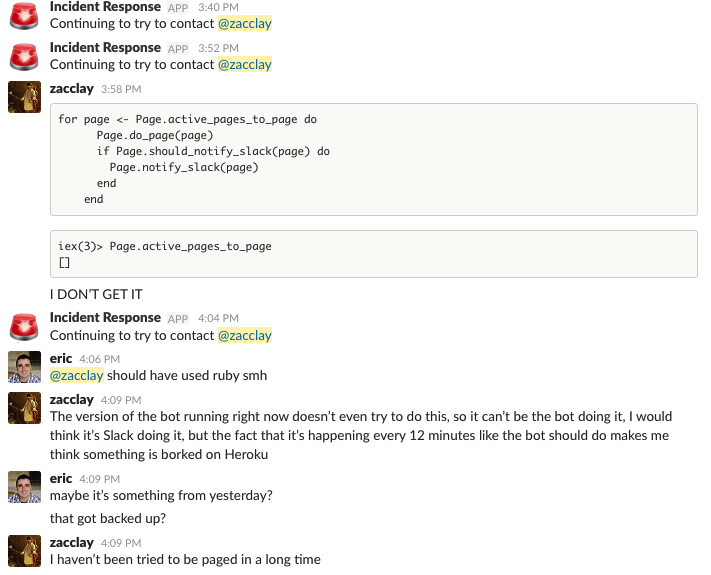 No really, I've tried everything, I am doomed to live the rest of my days forever haunted by the words "Continuing to try to contact"
I knew in the deepest parts of my heart that the problem had to be some sort of rogue version of the bot running on Heroku somewhere just stuck in a loop. 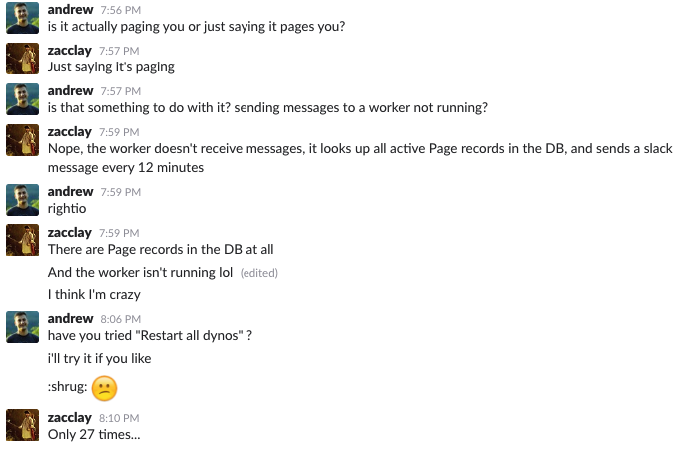 If only I could do the right combination of deploying commented-out code or restarting the dynos. There was absolutely nothing else that could be the cause. I was so sure I knew what the problem was. I didn't know how to solve that problem quite yet, but at least I definitely knew what it was. I spent an inordinate amount of time and effort working on perfectly good, valid solutions to a problem that didn't exist. By telling myself that I knew beyond a shadow of a doubt what the problem was, I limited the possible solutions. Any possible solution I tried had to fit what I "knew" the problem was. This was all for a very insignificant, simple issue. Imagine how much time, how many resources, how many companies are wasted trying to solve problems that don't exist. Don't assume you know what the problem is. Get multiple opinions from other people. List other possible problems, even if they seem crazy. Talk to a duck or try faking it. If you get the problem wrong, it doesn't matter how hard you work, you will make no progress. You might even make things worse. We'd love to write and tell you about all the things our engineering team does behind the scenes that make our lives (and our product) awesome. Coming really soon. Promise!